A central tenet of the Feldenkrais Method assumes that human beings have transformational potential and that all people, regardless of their age or condition, can learn. At the core of the Feldenkrais Method is a fluid and dynamic state of mind that fosters a process of inquiry rather than one that seeks to define solutions. 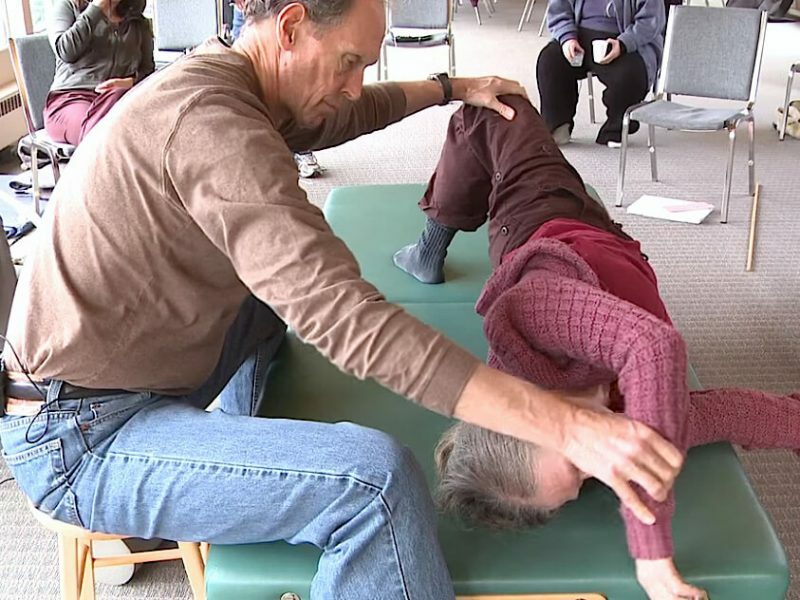 Years ago, the faculty of the Feldenkrais Training Academy (FTA)  set out to find superlative methods for developing students in their journey to become professional Feldenkrais practitioners. We have extensively reviewed information on competence assessment and educational development. We concluded that reflection and intention are the necessary elements for all growth, development and learning. In educational programs, imparting knowledge and developing skills are necessary, but not sufficient, for all what we want to accomplish. “…there are some people in every profession who become truly outstanding practitioners. These practitioners are not described as having more professional knowledge than peers, but are described as wise, talented, and intuitive, more aptly, artists. We want to help our students, and ourselves, seek wisdom and maturity in a context where reflection is integrated, planned and evaluated. The high bar for professional competence is artistry, and we need to carefully examine the path to achieve it. Schön (1987) argued artistry is teachable and not just for the fortunate. An artist is an outstanding professional, who, faced with an unusual circumstance, novel situation or ambiguous area of practice, goes beyond the basic knowledge, technical and applied skills, and learned values and becomes a creative, innovative problem solver. This ability is based on knowledge, skills, attitude/values and experience, but also moves beyond them. Artistry requires ability, when faced with something unexpected or not-yet learned, to think about what one is doing as one is doing it (reflection-in-action), and to be able to create solutions when there is no clear right answer. The real essence in developing artistry and the heart of the creative process is being able to cultivate an attitude of not-knowing, literally, learning how not to know. The explorations that this kind of learning evokes are based not only on a cognitive or intellectual inquiry, but on somatic action and interaction, a way of cultivating curiosity, wonder and exploration. In short, we are interested in developing self-regulated learners within the broader goal of artistry. Self-regulation is an expansive concept that includes self-reflective practice. Self-regulated learners assess their own progress in terms of their goals and can adequately reflect on their development. This process enhances student satisfaction, motivation to improve, optimism, and the likelihood of becoming a life-long learner. Focusing on developing defined competencies is definitely a paradigm shift in the world of Feldenkrais Professional Training Programs. It is the spine of this training program. We believe more students will be able to achieve entry-level competence in the knowledge, skills, and attitudes of the Feldenkrais profession using this approach. It is our hope to improve the educational training program experience for our students and to develop a learning community that supports aiming for artistry in practice. I agree with the difference or inclusion between competency & artistry. Self-reflective learning is a key to experiential learning. One idea which is an overlooked ingredient of my learning is intension. I sometimes become so focused on the (techniques/ confused with competency) that I lose site of assisting the client in exploring new possibilities. In my current state as student/practioner I sometimes have glimpses of attending to multiple aspects of client and myself. What is many times lost for me is to also maintain the more broad intention putting the parts together for a meaningful lesson for the student/client. As for my understanding of the artistry of a professional, in my previous profession as a physical therapist there have been areas in which I performed as Schon described with chacteristics of an artist. I aspire to move towards the competencies of a Feldenkrais artist.